The following requirements should be adhered to when planning to install a Tankless Water Heater in Chandler, AZ in your home. Failure to stick to these requirements could lead to. Voiding the warranty given. Shortened lifespan of your installed unit. Improper operations of the unit Safety hazards. It is of great importance to read the manufacturer’s manual before embarking on the installation procedures to know the steps to follow. You should know that installation requirements vary with models. Therefore, each installation requirements for a particular model can be found on installation manual. The following tips will provide basic guidelines needed. If your area has local codes, they are supposed to be followed to comply with the law. In case they are not available, you’re required to comply with the National Fuel Gas Code in USA or with the National Gas Propane installation in Canada. The manifold gas pressure should not be adjusted since it is already pre-set at the factory. Adjusting it would lead to violating the warranty given by the manufacturer. The water heater should be installed in an area where there is free flow of air without any obstruction. This will help to improve its lifespan and performance. The unit source of power should have a means of disconnection to be used when servicing and also for safety precautions. All models requires a 120 V AC with about 60 HZ. Install the unit where it is supposed to be installed i.e. indoor or outdoor. The water heaters can either be installed inside or outside depending on its specifications. The outdoor models are more secured and can withstand weather conditions. The exhaust vent should not be pointing into another building opening to avoid inconveniences. During installation, consider your neighbors well-being to avoid problems in near future. Install the unit in an area where there is enough space left in case of servicing. The unit should be easily accessible when being repaired or replaced after installation. 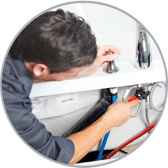 If you need help with your Tankless Water Heater in Chandler, AZ, call us today.